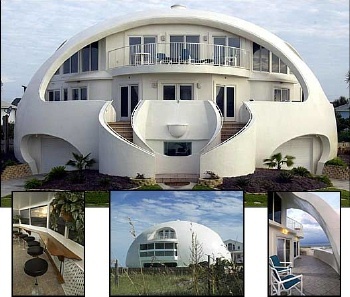 Concrete Dome Homes - What Is A Concrete Monolithic Dome Home? Concrete dome homes are a great choice for building owners looking for a safe, long lasting, energy efficient building, at a cost that is competitive, and often less than conventional construction. 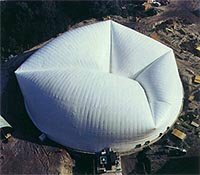 A monolithic concrete dome is an insulated, thin shell concrete structure that is extremely strong and fire safe. A concrete dome is nearly invulnerable to tornadoes, earthquakes, hurricanes, and other natural disasters. 1. THE FOUNDATION - The monolithic concrete dome starts with a concrete ring foundation, reinforced with steel rebar. Vertical steel bars are embedded into the concrete ring and later attached to the steel reinforcing of the dome itself. 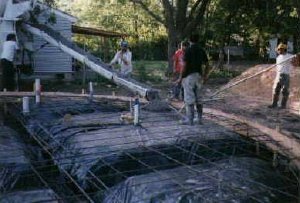 Small concrete domes may use an integrated floor-ring foundation. Otherwise the concrete floor is poured after completion of the dome. 2. The Airform - This is a "balloon" made of nylon/polyester mesh impregnated with PVC. The airform is extremely tough, and it becomes the roof and exterior walls of the finished dome. 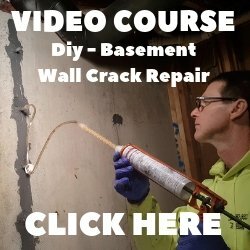 The airform is attached to the foundation with a steel strap that is bolted to the concrete slab. It is inflated with special fans to the shape of the completed dome. 3. 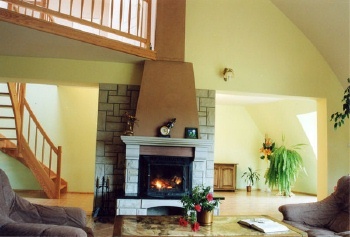 Insulation - Polyurethane foam is applied to the interior surface of the airform. Entrance into the air structure is made through a double door air-lock which keeps the air pressure inside at a constant level. Approximately three inches of foam is applied. The foam is also the base for attaching the steel reinforcing to the concrete dome home. 4. Steel Reinforcing - Steel reinforcing is attached to the foam using a specially engineered layout of horizontal and vertical steel rebar. Small concrete domes need small diameter bars with wide spacing. Large dome homes require larger bars with closer spacing. 5. 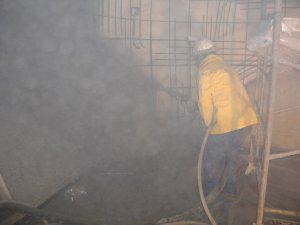 Concrete - Shotcrete is a special high strength mix of concrete. 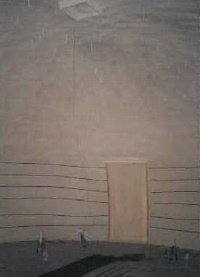 It is sprayed onto the interior surface of the concrete dome, covering the polyurethane foam and mat of steel reinforcing bars. When about three inches of shotcrete is applied, the self-supporting shell of the monolithic concrete dome structure is finished. After the concrete has set-up, the fans can be shut off. The concrete dome is now completely self supporting, there are no posts or beams. The inside can now be finished similar to stick built homes. The interior space of a domed concrete home can include a sauna, indoor swimming pool, exercise room, and theater, as well as all the "normal" rooms a home would have. 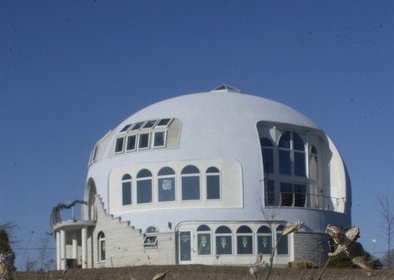 Monolithic cement dome homes can be everything you want and dream about in a home. 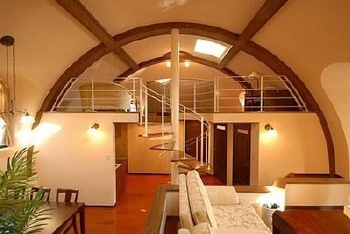 They can be small and cozy, spacious and luxurious, one-storied or multi-level. 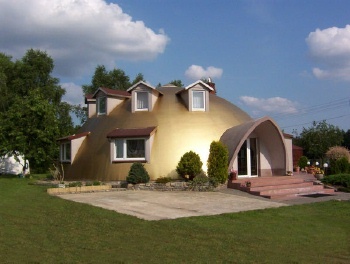 Domed concrete homes can be built at ground level, underground, or earth-bermed. They can be built in virtually any location and environment. 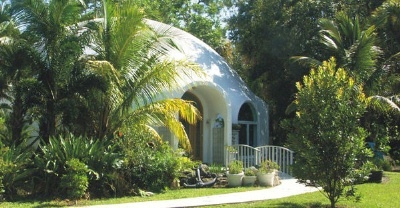 A home made with a concrete dome uses about one-fourth the energy of a wood structured home. 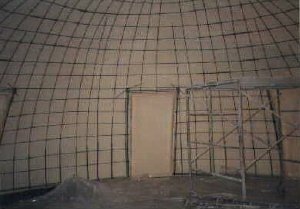 A monolithic dome has an effective R-Value of 60 and the polyurethane foam provides the best vapor barrier of any insulation available. If you are looking for a very low maintenance, highly energy efficient, ultra safe & durable home, then a concrete dome home is an excellent choice. 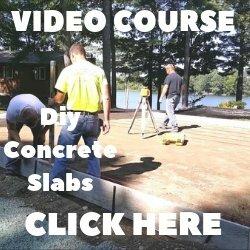 Click on CONCRETE HOUSE PLANS to learn about different styles of concrete homes.